In the 1930’s the French Dominican friar and Catholic priest Marie-Alain Couturier was enabled by his order to devote himself to new art in the Catholic church. The enthusiastic clergyman was annoyed at the superficial art and church architecture of the 19th and 20th centuries. He looked back with longing to the élan of the time of the great cathedrals. His approach was to summon well-known artists and architects to participate in the building of new churches and to also involve the local community. Perhaps it is not ideal when those of different beliefs receive commissions for art in the church, yet the results of their labour show time and again that this is a worthy option, especially when artists of faith do not want to work under the authority of the church anymore or simply do not know how to go about doing this in a way that is contemporary. In the same way, Solomon had involved artisans from a foreign country in the building of the temple (2 Chronicles 2). Also the interior structure of this church designed by architect Novarina is straightforward and simple, so that all attention can be focused on the message that is communicated in this space in word and image. The floor with its wave motif continues the theme of water. The 17 stain-glass windows by Fernand Léger, running along the upper side of the three walls, resemble a crown. They depict various aspects of the meaning and life of Christ. Behind the altar hangs a tapestry by Léger with grain, grapes and fishes. It meaningfully combines with the three windows depicting Christ’s crucifixion right above it, with the five wounds of Christ shining like five suns in the centre. The sacrament altar (not shown) is situated in the crypt beneath the church, which can be reached by descending the stairs behind the tapestry. The space offers the opportunity to pray, reflect or celebrate the Eucharist in quiet seclusion. The serene and intimate atmosphere of the crypt stands in stark contrast with the euphoria of the baptismal chapel close to the entrance of the church. 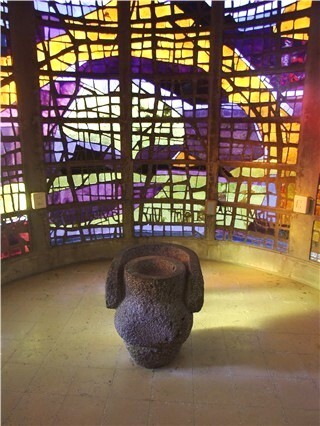 The walls of this round chapel are completely covered with stain-glass windows by Bazaine, so that the visitor is immersed in a feast of movement and light. Here Bazaine continues the theme of the water used on the façade, inspired by the text from Ecclesiasticus (or Wisdom of Jesus Sirach) that runs along the bottom of the windows: ‘Aujourd’hui mon fleuve est devenu mer. Au matin je ferai luire la Parole’ (And, lo, my river became a sea. I will yet make doctrine to shine as the morning, KJV). 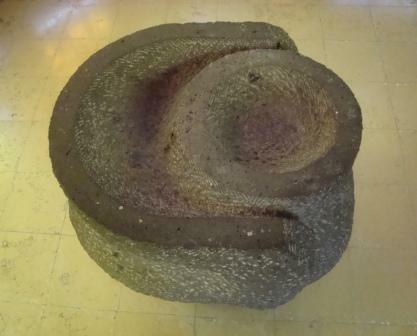 The baptismal font is sculptured out of lava by Etienne Martin; the rim along its upper part enfolds the baptismal font in a protecting embrace. And so it happened that an inconspicuous industrial town like Audincourt acquired a church that is advertised on big signs along the motorway as a special feature of the area. This is to be expected when a cleric attracts artists like Léger and Bazaine to ecclesiastical art. When we were visiting men were busy installing underfloor heating: a sign that the original goal of its erection is still being done justice, namely offering a place of worship to local believers. When you decide to see the church for yourself, combine it with visiting the magnificent Notre-Dame-Du-Haut in nearby Ronchamp. Evidently also a church that cannot be thought of without the vision of Marie-Alain Couturier. 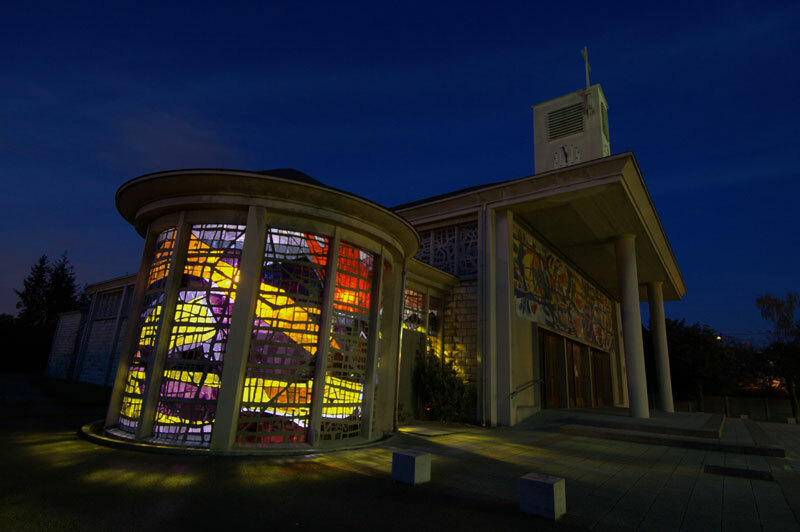 For more information about Couturier and the artists and churches influenced by the Art Sacré movement, click here. To read about another well-known church of the Art Sacré movement, Notre-Dame de Toute Grâce (Our Lady of All Grace), Plateau d’Assy in France, click here.